In his English class, Mr. Browne assigns a monthly essay to his students where they are required to analyze a precept, or adage. At the end of the year, he gives them a postcard with his address and asks that they send him their own precept. And now, with thousands of inspirational words in his possession, Mr. Browne has compiled a book with a precept for each day of the year. Focusing on kindness and overcoming hardship, he hopes all can benefit from some uplifting messages. 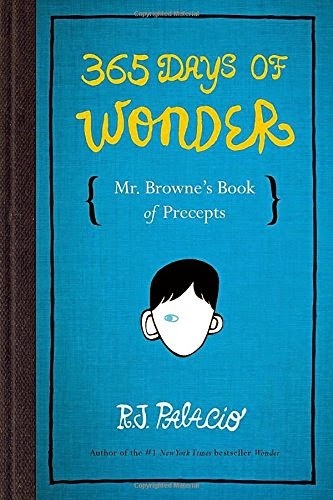 As a companion to Wonder, this book has its fictional elements: Mr. Browne the teacher and his correspondence with various students correlates with the main novel. It wraps up some loose ends and delves deeper into the Mr. Browne's character. But the sayings that fill the pages are true quotes from some of the most inspirational people in history. And they are incredibly uplifting indeed. Even if you haven't read the main novel (which you totally should, oh my gosh, it's beautiful), the precepts in this collection are fantastic. I wanted to rip out some pages and stick them on my wall so I could look at them every day. If you want to be uplifted, whether you are 12 or 112, you should definitely give this book a try.